Join Over 35,000 People Who Want the Warm Line Fully Funded! "I work on Talkline, the Warmline with Northern Valley Catholic Social Services. I've talked to people who miss this Warmline and want it back. Warmlines are a lifeline for so many people who are isolated and alone or can't talk to family or friends. We at Talkline wish you all the best. You are needed!!!!" Sign our petition to get the Warm Line fully funded! We need your signature to show local politicians that there is a great demand for our Peer-Run Warm Line (415-421-1880) to be refunded back to 24/7 status. People outside our Bay Area Warm Line coverage are in desperate need of emotional and mental health support services, but because of a lack of funding, we cannot consistently serve them. 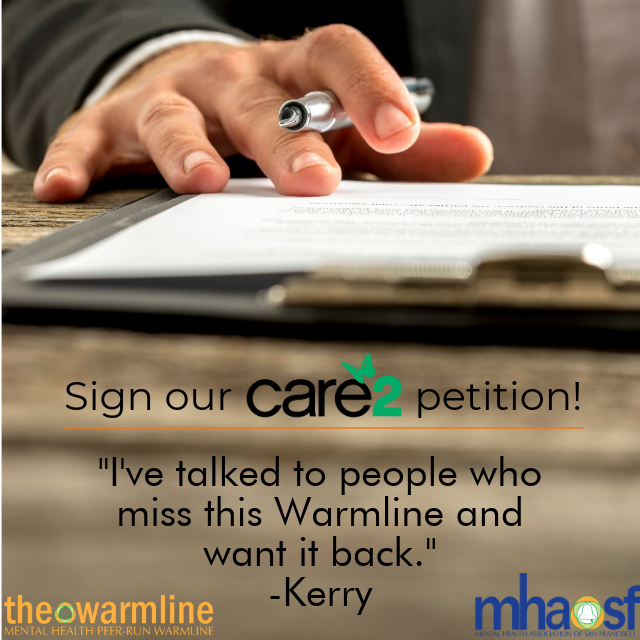 Join Kerry and over 35,000 people from across the world who signed our Care2 petition!